Do you want to do something to help your baby with the pain of teething? Are you worried about the safety of the materials they’ll be chewing on? Watching your baby feeling so uncomfortable is tough. It’s a mother’s instinct to try to protect their children from everything they can, or at least do everything in their power to help. But we can only do so much. Though some things, like teething, have to be tackled by your baby, it doesn’t mean you can’t still help a little! In this guide, we’ll show you everything you need to know about finding the best teething toys for your baby. Use the links above to check the latest prices or read our in-depth teethig toy reviews below. Do Babies Really Need Teething Toys? Teething toys aren’t a necessity, but as a parent, I can tell you they’ll feel like a lifesaver at times. When your baby is experiencing pain from teething, you’ll know all about it. Everyone in the household will. Your usually sweet and calm baby can turn fussy, weepy, and even enraged. Your little one doesn’t know what’s happening — all they know is that they’re experiencing pain, and that can be frustrating for both of you. If they can provide some comfort to your baby and a little peace and quiet for you, why wouldn’t you get one? That simple act of chewing can help them relieve the pressure they’re feeling on their gums. In addition to the pain relief, they’ll get, babies like teething toys for other reasons as well. Babies love putting things in their mouths and doing so can help fine-tune their motor skills. They learn to move their tongues around, and are encouraged to learn about the world around them (source). You can see proof of this by watching any baby, even if they don’t have a toy with them. They’ll chew on their fingers, their blankets and anything else they can get their hands on. It gives them comfort and helps them with their development. When Should I Introduce Them? Most babies will get their first tooth when they’re 4 to 6 months old (source), but teething pain can start weeks before that. A good rule of thumb is to have teething toys at your house from the time your baby is about 2 months old. That way you won’t be scrambling to buy some when you realize they need them immediately. As a parent, it’s always best to be prepared for situations before they occur. You’ll be less stressed if you have a plan for everything. You’re going to want an assortment of different types. You don’t want to buy just one because your baby may hate it. I used to buy teethers for my kids and sometimes the ones I thought they would love, they ended up hating. Other times, people would give my children a teething toy as a gift, and I didn’t see anything special about it, but they’d end up loving it. Either my kids were contrary from an early age, or that’s a common experience. There really is no rhyme or reason as to what toys children like at this age, so it’s a good idea to hedge your bets by buying a number of them. That also covers you if one gets misplaced. You always have other ones they can try to use in a pinch if their favorite is nowhere to be found. To begin with, aim to have about five different teething toys on hand for your baby to choose from. They’re inexpensive compared to all the other baby gear you’ve had to purchase and you’ll gladly pay for them once your baby starts crying and fussing over a tooth that’s about to pop through the surface. 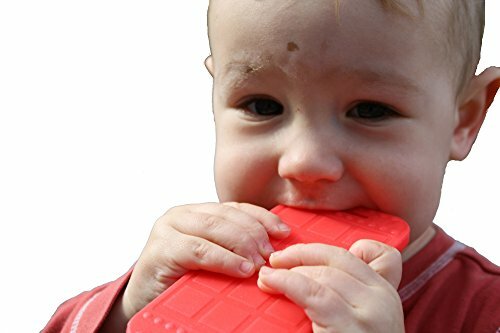 There is such a wide variety of teething toys available now that you really need to put some thought into what you want or you’ll be overwhelmed. Here are some factors to consider to help you narrow your search. Material: Some moms can feel their blood pressure going up just thinking about their baby chewing on a plastic teether. They worry about the harmful chemicals their baby may be ingesting. If plastic isn’t to your liking, there are other options, like wood or silicone. Fillings: Some products are filled with a soothing gel-like material that you can refrigerate to keep cool, which feels great on your baby’s gums. But if you’re anxious about your baby potentially poking a hole in the teether and possible swallowing some of that gel, you may want to skip this type. Clips: Your baby is going to drop so many toys, it’ll drive you crazy every time you have to bend down and pick them up again, especially if the ground is dirty. One way to solve this problem is by getting a teething toy that clips onto their outfit. Easy grip: Babies seem to have the best grip on products that have a ring for them to hold onto. Toys that a straight handle were always trickier for my babies to use. Noisiness: Some products make a squeaky noise when babies bite on them. That may make your baby smile, but it can annoy you after a while. When your baby isn’t crying, you may love having nothing but silence in your house. If that sounds like you, you’ll want to skip things that squeak. Size: Choking is a real hazard with babies. Since they love to put everything in their mouths, they’re at increased risk of choking on things. Because their airways are so small, it doesn’t take much to plug them up (source). You’ll need to make sure their teething toy isn’t so small that they could stick it entirely in the mouth and choke on it. If this is your first teething rodeo, be prepared for a little drama: teething kids can be grouchy, fussy and covered in dribble. It might not seem like it, but that handful of teething toys could save your sanity on a difficult day. Come armed with a wide variety of teethers and your baby will leave this phase of their life smiling — with a brand-new set of chompers. Here are some of our favorite teethers on the market. 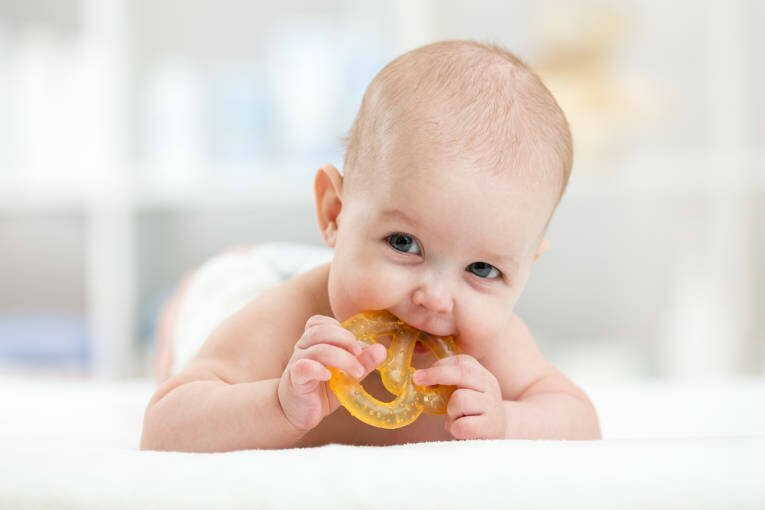 Rings are popular shapes for teethers because babies have an easy time holding onto them. Rings that have different textures on them are nice because, depending on how your baby’s gums feel, they may want various textures to explore. 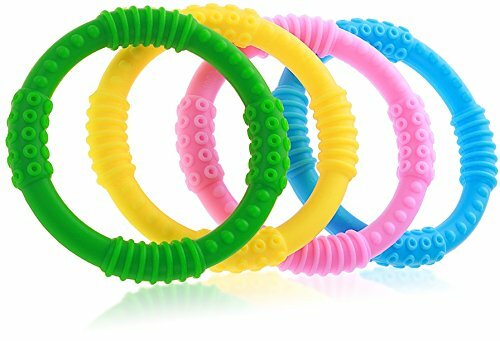 Moms who like traditional teething rings should approve of this four-pack set. They’re non-toxic, phthalate-free, BPA-free, and they come in four different bright colors. Each silicone ring has several different textures on it so your baby can find a spot that feels good on their aching gums. The ring shape, along with the texture, will help your baby get a firm grip. You can also slide them on your wrist so your baby has one whenever they need it around the house. They’re dishwasher safe for easy sanitizing. Babies can hold onto them easily. It comes with an e-book that shares remedies to help your baby with teething. They may be a little large for small babies so they won’t be able to reach their back teeth. Might be a bit expensive for four simple rings. Silicone has been gaining steam as a material for baby products. You’ll see it in bottles, sippy cups and even teethers. Silicone is so flexible that it’s gentle on a baby’s gums, which is good for when your baby only wants soft pressure on their mouth. 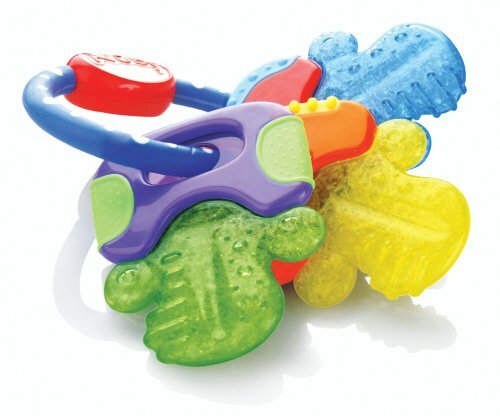 This teether is made entirely of soft, chewy silicone. One end has flexible bristles that can help soothe your baby’s sore gums. It also has different textured surfaces on the handle and the end of the teether so your baby can chew on either side of it. When not being gnawed on, it comes with a carrying case so you can keep it clean, which is perfect for moms who want to take it along in the diaper bag on trips. The small ring attached makes it easy for babies to grab onto. It comes with a case so it won’t get dirty when not in use. If you have pets, their hair will stick to it like crazy. It’s a bit big for babies who are cutting their first teeth. When your baby is this young, you’ll want to find a teething toy that can clip onto their outfits. They won’t be great at holding anything up to their mouths for long at this age. Having that clip will save you a lot of time washing off the teether after it lands on a dirty floor for the hundredth time. You can order this with one silicone teething toy or two teething toys — one hard and one soft so your baby will have just the firmness they’re looking for. To entice your child into wanting to try these, they’re made to look just like cookies. That’s why they’re are perfect for 3 and 4-month-olds, who are at that point where they’re very interested in adult food. But, unlike toddlers, they don’t yet realize the delicious flavor that cookies normally have so they won’t feel cheated when they start chewing on these! Because it looks like food, your baby will want to bite into this. It comes with detachable cords for the stroller. The teether has a textured surface which seems to massage your baby’s gums. The cord should only be used under strict parental supervision. The cream on the cookie is actually a separate ring — it’s not all one piece. Toddlers need a heavy duty teether that can hold up to all the teeth they already have. They need something that will be durable. Having different textures for them on the toy would also help. Toddlers are like teenagers in some ways — they both love to get their hands on phones. Since this teething toy is made to look like a phone, toddlers will want to check it out. With a phone of their own, maybe they won’t be as interested in your phone now. This teether is also easy to clean — you just have to rinse it off. The smooth, rounded edges won’t be too sharp for your baby’s mouth, and the phone is big enough that it’ll fit well in your baby’s hands. It’s easy for toddlers to hold. The phone has ridges on it so they can chew on the part that feels most comfortable. It may be enough to get your toddler to leave your phone alone! Because it doesn’t make any noise or have more than one color to it, it may not keep your toddler occupied for long. Kids are drawn to animals. Even when they’re babies, they love watching them on television, seeing them in books and trying to imitate animal sounds. They’ll love having a toy animal teether to chew on and play with. 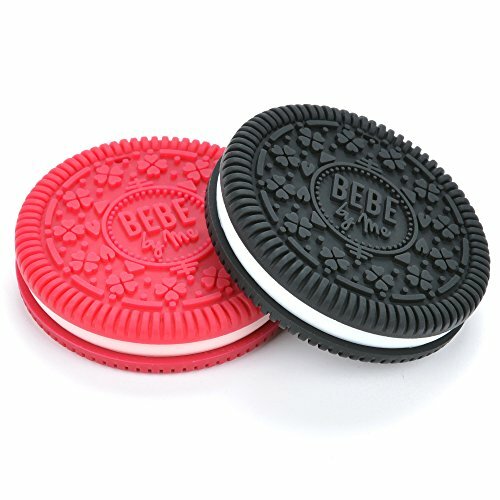 This is an adorable product offers a lot more than just teething for babies. 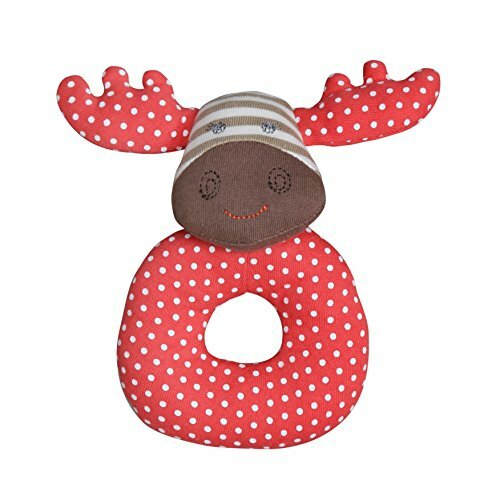 The antlers on the moose are soft teethers your baby should have fun chewing on. 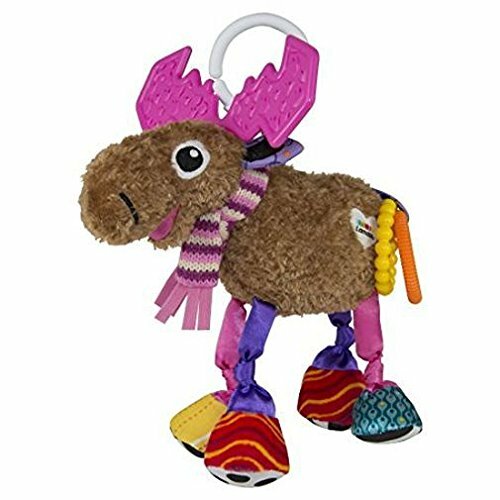 The legs of the moose will crinkle every time your baby grabs them, which will make your baby want to keep doing it since they’ll be rewarded with that noise. When your baby presses on the stomach of the moose, it makes a squeaking sound. The moose also has a clip which will keep it attached to your baby’s stroller or diaper bag. That means when you’re out on walks, you don’t have to worry about the moose being dropped on the ground and accidentally left behind. The body is soft so your baby can cuddle it. This toy has multiple textures to keep your baby interested. It has eye-catching bright colors. When you have it hanging off a stroller, your baby won’t be able to reach the antlers to chew on them. It’s big enough that your baby may well have trouble holding onto it. When you put teethers in the freezer, you only want to do so for a little while and you don’t want anything that will freeze solid. Hard ice could end up hurting your baby’s teeth and gums when they chew on it. Plus, it could be too cold on their gums. 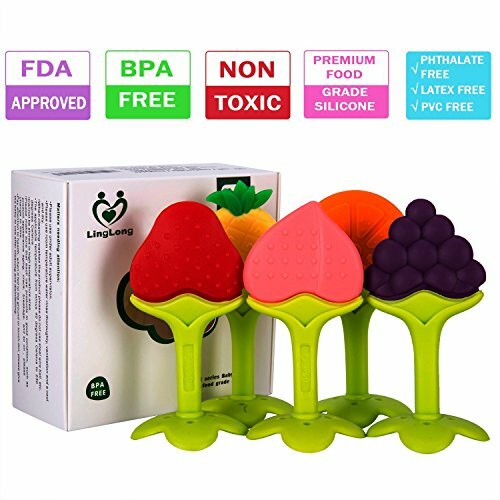 This five pack of fruit-shaped teething toys can be stashed in the freezer so your baby will feel the soothing chill whenever they chew on them. Concerned about safety? These are FDA approved and made out of food-grade silicone, plus they’re phthalate-, latex-, BPA-, lead- and PVC-free, so no worries there. The fruit toys have various textures so your baby will get a different sensation with each one. The handles also have a no-slip grip so your little one will be able to hold onto them well. These teethers will all feel different on your baby’s gums. They are affordable considering you get five. They’re safe in the freezer as well as the dishwasher. You’ll have to watch your baby closely because these are on the small side, and your baby may be able to fit the whole thing in their mouth. The handles are very thin, which may be tricky for younger children to hold. Moms who avoid plastics like the plague will be happy to know there are some natural teething toy alternatives out there. Look for a teether that’s made out of a material you feel confident offering your child. This charming rattle is made out of 100 percent organic cotton, so you don’t have to worry about your baby really tucking into it. It also uses sustainable corn fiber filler, which is natural and hypoallergenic. These toys are safe for any age, and moms who are concerned about unnatural substances in their baby’s toys might like that these are good for baby, and good for the environment. This toy feels cuddly, too, in case your baby wants a little reassurance when they’re done doing the hard work of teething. 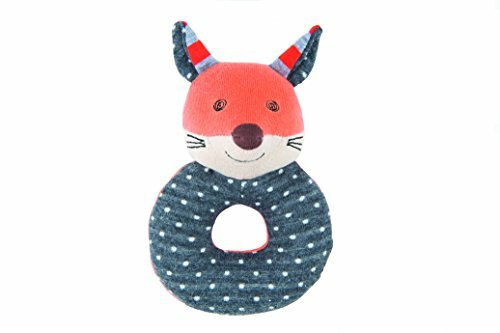 The teether is cute looking and comes in different animal characters like fox, mouse or raccoon. The rattle part is pretty quiet. The handle is fairly big which makes it difficult for a younger baby to grasp. It doesn’t hold up very well in the wash.
Wood is a natural substance you can trust since it’s been used by man since the beginning of our existence. Wood makes an excellent teething toy for a child — you just need to make sure it’s smooth, and you might also want to check that it's untreated. 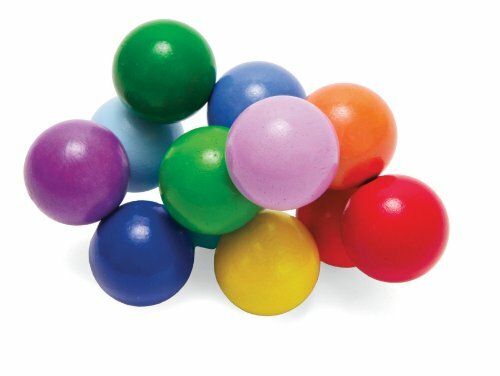 These giant wooden beads are connected by elastic, and with all the bright colors featured on the beads, they’re visually appealing to babies and toddlers. But the color doesn’t pose a threat for your child because it’s non-toxic and water-based. The wood won’t splinter or chip so your baby won’t end up with more gum pain than they started with. Your baby will also like using this teether as a rattle. When they pull on the beads or twist them around, they’ll make a fun clanking noise. These are big enough your baby wouldn’t choke if the elastic breaks. Some moms will love that this is made without toxic chemicals. The bright colors are attractive for babies. It’s pretty heavy for younger babies. When babies whack themselves in the face with this toy, it’s going to hurt because of its weight. Nuby baby products are popular because they tend to be well-made and affordable. This company makes durable teething toys for a wide range of ages so you’ll be able to find one that works for your baby all the way to their toddler years. These cute keys come in different bright colors and they’re all attached to a ring. There’s a variety of different surfaces your baby will love gnashing on: the softer parts feel great when their gums are tender, but other times, they’ll go for the harder parts. Your baby will be able to reach their back teeth with this, too, as well as the front and middle teeth. Plus, the ring makes it easy for even younger babies to hold on. You can stick this in the refrigerator for a while to give your baby an extra cooling effect. They’re affordable, so it’s no big deal if you lose one. The different textures will feel nice on your baby’s gums. Some parents have trouble with the keys leaking. Because of all the nooks and crannies on this toy, it can be hard to clean thoroughly. A set can give you a great variety of teething toys to choose from, so even if your baby is picky they should be able to find one they like. The set will also keep you covered if you can’t find one of your baby’s teething toys — you’ll always have a back up. This fantastic set comes with nine teethers and rattles for your baby to enjoy. They each use multiple bright colors on every teether, which will help attract your baby’s attention. The ABS plastic they’re made from is nontoxic since it’s BPA-free. The set also comes in a cute baby bottle carrying case, so when your baby gets a little older, they can have fun putting each teether in the case one at a time and dumping everything out again. The case also makes this set easily portable, so it’s great to take with you on vacation or to a babysitter’s house. Some of the toys make noise, which will keep your baby entertained. A wide variety of different shapes to choose from. You’ll get a lot of toys for the price. The edges are a little rough on these. Some parents may find the horn toy’s noise way too loud. The 4-pack of teether rings are at the top of my list. They’re simple, but I like that about them. They are everything I want in a teether — easy to hold, easy to chew on, non-toxic and they have different textures for your baby. I also like that they aren’t filled with any liquid or gel because I’ve had the unpleasant experience of those breaking open before while my baby was chewing. Even when the package says the liquid won’t hurt your baby, you still wonder what it’s made of. With these, you won’t have to worry about anything leaking out. When you need to clean them, you can just pop them in the dishwasher. As a parent, you’re going to learn to appreciate items that don’t have all the bells and whistles and prefer straightforward products. That’s precisely what these teething rings are. Moms with drooly, dribbly babes out there, what has your little one chosen as their top teething toy? Share in the comments! Great information Jenny and thanks for sharing. I wish I’d run into this post much earlier while my little one was going through this process though :). As a parent, it is hard to watch your little one go through this painful process, which is why it is important to know all about teething so that you can offer your child every comfort while he/she is teething. It’s also great to know what remedies/toys are safe for them. If I can just add–reading through a couple of mom blogs, what I noticed a lot is new moms always wondering which is the “best” toy to buy the baby while teething. This is a difficult task because ultimately, it is whichever toy the baby chooses, which is why I strongly agree with buying a variety of toys and having the baby pick their favorite. Hey Michelle! Thanks so much for sharing your viewpoint. We definitely agree that the babies have the choice at the end of the day. That’s why variety is important. Thanks so much for reading!